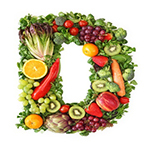 By a News Reporter-Staff News Editor at VerticalNews Health -- Vitamin D decreases pain in women with type 2 diabetes and depression, according to a study conducted at Loyola University Chicago. These findings were presented at an Oct. 24, 2013 research conference at Loyola's Health Sciences Campus. Type 2 diabetes is associated with depression and pain, but few studies have looked at how pain may affect the treatment of depression in patients with type 2 diabetes and no studies have evaluated the role of vitamin D supplementation on this association. "Pain is a common and often serious problem for women with type 2 diabetes and depression," said Todd Doyle, MD, lead author and fellow, Department of Psychiatry & Behavioral Neurosciences, Loyola University Chicago Stritch School of Medicine (SSOM). "While further research is needed, D2 supplementation is a promising treatment for both pain and depression in type 2 diabetes." "Vitamin D has widespread benefits for our health and certain chronic diseases such as type 2 diabetes," said Sue Penckofer, PhD, RN, study co-author and professor, Loyola University Chicago Marcella Niehoff School of Nursing. "This NIH grant will allow us to shed greater light on understanding the role that this nutrient plays in managing the health of women with diabetes."